To answer these questions our robot moves on to Figure 2, which can be visualized from any of many recent surveys regarding US public views on human origins. From Gallup 2012, this shows the proportion of people believing humans were created by God, or believing in ‘God guided’ evolution, or believing in a purely natural evolutionary process in which God plays no part, mapped against political allegiance. The interesting feature in this chart is the stripe in the centre. Ask any respondents in this stripe if they believe in God, they’ll say ‘yes’. And yet they disbelieve a fundamental tenet of the cultural text from which the concept of their God springs. Their God is not some other God, it is (overwhelmingly2) the Christian God, for which the only root validation that counts is the bible. A text with which they are fundamentally at odds. There is no latitude in this text for evolution (over thousands of millions of years), only complete contradiction well outside the scope of merely human fallibility in representing the divine word. This is a classic identity issue. Despite an awareness of major narrative inconsistencies, the identity and social embedding of these respondents is too tangled with their belief in God for them to deny Him. Yet allowed to respond in a manner that doesn’t so directly challenge their identity, they reveal that they don’t really believe in the core narrative of the religious culture that created the concept of their God in the first place. This kind of ‘convenient alliance with belief’ occurs at the edge of a culture, outside but linked to the domain of full belief, a fact our robot knows. Given that folks in both the top and bottom stripes say evolution is incompatible with creation, yet the ‘convenient belief’ links upwards to religious narrative, the robot deduces that the strong culture detected in Figure 1 must be coming from the top of this chart. Or at least mostly; there is still the possibility that the bottom of the chart is also CD, rather than ED. The robot from Mars is thorough. It also double checks for any ‘convenient belief’ linked downwards to atheism. No such is significant in public surveys currently6. This in itself suggests that the bottom stripe may be ED. A way to get confirmation is to look at the spread of host narrative into society. Via emotive memes a strong cultural narrative will spread to influence or even dominate many aspects of society; indeed our robot can observe wide social applicability in the US of Christianity now, and even more so historically. In contrast ED positions tend to have only limited applicability to or influence upon, social behavior. While the notion ‘belief in evolution’ does not really have a well defined host narrative like creationism does with religion, it certainly has solid roots going back to atheism and science. Our robot observes that atheism does not impose strong behavioral controls on many aspects of US society, or early incursion ahead of such. Rather it tempers aspects of existing religions. And knowing what science8 is, our robot also links this to the support of an ED position. The bottom stripe must be ED. Along the way the robot notes that there is another domain with wide applicability that regulates the behavior of folks in society, which therefore it suspects is cultural, and in which ‘Republicans’ oppose ‘Democrats’. Cultures typically form cross-coalitions with other cultures, and religious belief certainly seems to be a major component of both political parties. Maybe explicit atheism is still too challenging for either party, which would help to explain the width of the ‘alliance’ stripe. Yet there is significant asymmetry; the Republican party has a stronger link to religion. Back here on Earth, we can try to confirm the robot’s conclusion by looking at our society’s attempts to objectively measure itself across influence categories. In this case measure US society, as undertaken by Pew in Figure 3. This chart shows what factors influence US public views on the question of whether humans evolved due to natural processes. Footnote 4 provides guidance on what we should generically expect in the various categories. In particular, Figure 3 shows that the strongest influencing factors in the evolution versus creationism debate are Religion and Age. We humans would thus conclude that Religion constitutes the CD position, defended by older persons and also with extension into Education and Ideology, the latter through the asymmetrical relationship of US political parties with religion, per Figure 2. The ED position fights back in Education, and via youth plus in part the Democrat party. Race seems unimportant for this topic, and I have no clue why Gender is involved. While the robot from Mars has not our intimate knowledge of Earth civilization, Figure 3 is at least consistent with its findings thus far. It also knows age is a battleground for newer ideas (ED or CD) that challenge existing culture. 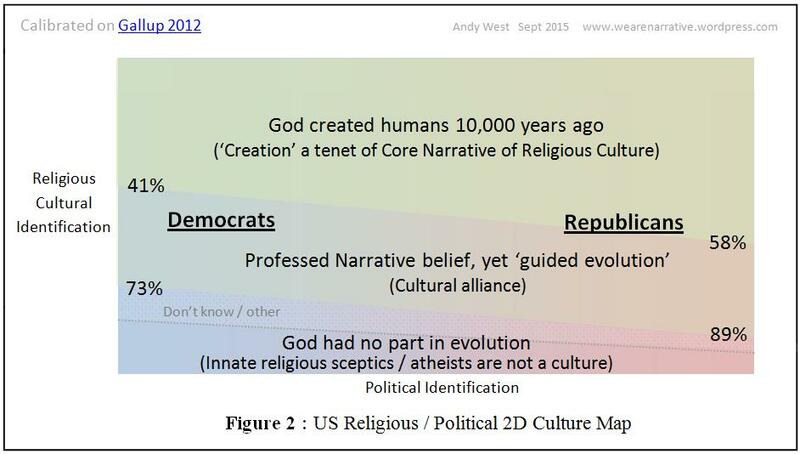 It can see that ‘Religion’ is the very same domain that hosts the narrative of creationism, which it already fingered from Figure 2. And it knows that where a CD position is in play, polarization per Figure1 may prevent Education overall being a top influencer1. Plus from Figure 2, it expects Party weighting wrt support of religious narrative. All consistent. So, it would then attempt to validate this candidate confirmation, by looking at the same Pew system for a different controversial topic that pervades US society; for instance GM foods per Figure 4. Here the robot sees a completely different picture from Figure 3. Those topics it suspects are main cultures (far left and far right) do not feature. And ‘Education’ is the main driver of attitudes for this topic. Whatever turf wars and psychology are going on, these are not currently driven by a mainline culture. While not knowing what the issue of GM foods is all about, it can conclude that this Pew self measurement system is capable of picking up debates where only ED/NED positions compete, i.e. mostly non-cultural, which it knows would likely feature ‘Education’ as the largest influence4. This adds to its confidence in the system, and supports the likelihood that those influences reported in Figure 3 are real, reflecting the battle of religious culture against an ED position. So with knowledge of social analysis supported by only modest perceptions of current Earth civilization, and acquiring only the most simplistic domain detail regarding the creationism debate, our robot rightly attributes a CD position to the creationists, and an ED position to those promoting evolution5. This entry was posted in Social Psychology and tagged climate change, Climate Etc, Dan Kahan. Bookmark the permalink.